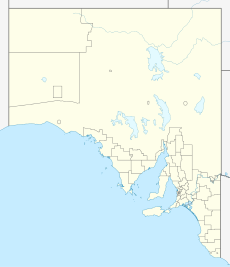 Salt Lagoon Islands Conservation Park is a protected area covering two islands and some adjoining waters in Salt Lagoon at the south east extent of Lake Alexandrina in South Australia about 14 kilometres (8.7 miles) south-west of Narrung. These two small islands are one of the main breeding sites for a number of the larger water birds in South Australia. Species known to breed there include two species of spoonbill, three species of egret, four species of cormorant, three species of ibis and the Nankeen night heron. The conservation park is classified as an IUCN Category Ia protected area. In 1980, it was listed on the former Register of the National Estate. ^ "CROWN LANDS ACT, 1929-1966: FAUNA CONSERVATION RESERVES DEDICATED" (PDF). THE SOUTH AUSTRALIAN GOVERNMENT GAZETTE. Government of South Australia. 16 March 1967. pp. 961–962. Retrieved 5 February 2018. ^ "Protected Areas Information System - reserve list (as of 25 November 2014)" (PDF). Department of Environment Water and Natural Resources. Retrieved 8 January 2015. ^ "Salt Lagoon Islands Conservation Park". Gazetteer of Australia online. Geoscience Australia, Australian Government. ^ a b "Salt Lagoon Conservation Park, Salt Lagoon, Narrung, SA, Australia (Place ID 7913)". Australian Heritage Database. Department of the Environment. 21 October 1980. Retrieved 19 December 2018. This page was last edited on 2 March 2019, at 07:47 (UTC).